The end of one more year - a year of working with all breeds of dogs - a year of being the voice of animals who have no choice but to feel the pain of captivity - abuse or victims of the ONGOING law that destroys families - seperates canine pals and in a lot of cases KILLS healthy vibrant family dogs who are seized not because of dangerous dog issues BUT being born TYPE - THIS law - BSL. RIP all those we could not save - newly born pups - seniors - who died alone not knowing WHY! The end of one more year where our precious pets - rescue dogs who we have rehomed - and watched grow - who have held a special place in our heart. The loss of our feline and canine family members who at their passing have taken another piece of our hearts as we say our 'Final Goodbyes' and gently lay them down to their final sleep. My Darling Maisy - who I rehomed in 2002 to a wonderful couple - who even when my own 'dog behavioural business' started to build up I still never gave up walking her - Maisy who ran after everything that moved - 'joggers' 'small fluffy dogs' 'horses' - bikes - Maisy who was the first dog to be banned from the residential gardens of Kensington W11. Maisy who gave the best kisses - who laid in my arms and when you really met her and she liked you - you fell in love with such a deep and beautiful love that took a part of your heart that broke in two when she was first diagnosed with cancer and when she died at the end of this year I felt a loss so great that tears filled up and overflowed with pain. Maisy my beautiful girl as your dear owners said You were a huge part of our lives - we all rescued you - we all cherished you and what a bl.....dy good life you had and how blessed we were to have known your love. RIP Darling Girl You will never be forgotten. To Marsha Jones who lost her Ruby Girl so soon before Christmas and whose presence is so missed by all that knew her especially her human family and her canine pals Benny and Doris. Ruby - daughter of Tilly - Ruby a shining light - Ruby a sweet staffie girl who gave so much love and asked for nothing in return. Thoughts and Sweet Memories will be treasured evermore. Run Free Sweet Ruby forever shining bright. The end of the year of dog workshops - educational projects - old ones gone but new ones in sight - White City Estate my next 'dog training educational classes' project - where already a lot of dog owners are looking forward to participating in training sessions - both educational and enlightening. A big TASK maybe - am I looking forward to it - you bet!! continue - PROTESTING against the Fur Trade - Factory Farming - Animal Slaughter - Puppy Farms and Dog Laws that make the dogs the victims and the let Abusers walk away - And remember WHEREVER a dog or any animal needs SAVING - wherever they are in the world - surely they ALL deserve a chance and our SUPPORT. A month of loss - A month when new laws have been put into operation regarding our four legged friends - new Dog Laws that again make many dogs and their owners the victims of over zealous authorities and new laws that already have claimed the lives of two dogs that I know of myself - and have felt the grief of both owners! One was a twelve year old staffordshire bull terrier lab cross - it took just thirty seven minutes to decide whether he lived or died - he was ordered to be destroyed - Rest Your Sweet Soul Luga. No loving arms to hold you - no final words of goodbye. The other was a mixed breed small dog who bit an intruder and under this law that victimizes many innocents were responsible for the ending of her life. What about the (words can never describe what I would like to call them) thug that beat a dog he obtained off Gumtree - Tyson a staffordshire bull terrier who he left to die or the woman who abandoned her boxer cross in her house when she moved - the poor dog died of kidney failure - in agony - tins of dog food just out of reach. - And the dog fighting rings - organised by vicious evil beyond inhuman. They walk free or a paltry 'few weeks' board. Well done The Justice System - you really have proved we ARE a nation of ANIMAL LOVERS. My pledge for 2015 is to keep fighting - being PART of the voice to urge the government to STOP - THINK - YES we need laws BUT TO PROTECT all animals against abuse - and Educate not only dog owners - the public - BUT also the media and the very officials themselves who carry out these very inhumane and outrageous laws and let abusers and animal killers walk free. What a month it has been, firstly we had the Queens Park Community Festival in its eleventh year in Queens Park Gardens W10 where we had a small dog show including categories 'Prince and Princess' ' Ilovemystaffi' 'Best Rescue' and 'Pup Idol'. A presentation by the Lord Mayor of Westminster of the Community Cup 2014 for the most 'Responsible Dog and Owner' - a joint win this year by Elvie the handsome black labrador and Maggie a gorgeous American Bull Dog. (photos coming soon). It was a great day for both dogs and the local community with amazing singing - and dancing acts. Everyone needs a break but when you got dogs and only one has a passport - or you don't want to put them through travelling abroad because of age etc - you miss them already before you have even left for the airport - and when you get there - you just feel 'Gosh How much they would love it here'!! So my holiday break was short and sweet and after driving my poor 'dog sitter' mad with last minute 'rules' - I arrived in Nantes in France met by my friends Mary and Micheal and taken to meet the real reason why I was there (only joking Mary mmmmmmmmmmmmm) to meet Tess the stunning German Shepherd Rescue who was so warm and friendly - knowing a 'softy' when she saw one!! The little rural village we stayed was beautiful and I spent wonderful hours exploring the fields - the local places of interest and of course the local village 'bars' - everyone smiling with a polite 'Bonjour' - thanks Mary and Michael and of course the lovely Tess for a great time. Oh and I must not forget the lovely little kitten Mary rescued and found a home for the day before I left - or I might have had an 'extra' 'someone to declare' as I went through customs!!! Back with my precious girls - Missy gave me the 'How could you leave me' Look and 'cold shoulder' treatment for an hour or two!! Chelsea jumped up and down and lots of kisses - Kiki Diamond was 'Any chance of that chicken and rice' we were given when you were away!! But then an alert went out on Facebook that a 'Romanian Dog' had gone missing in W5 and Niz Khan and I went and fly posted in the area - thankfully she was found safe and well and now is reclining on the sofa with her grateful and relieved Mum. My first dog show in White City Estate - not a familar area even though I had visited a few times to post flyers of the Dog Show I still got lost when I got to the estate to find the venue for the show!! Setting up the tables and marque for registration and putting the prizes and rosettes out - it poured down for about twenty minutes but thankfully the sun came out for the actual show - meaning a delay in starting. Thanks to my 'Dog Show Judges' Priya and Katie and help from Helen from the Parks Police and Ana and of course Emma Morgan from the White City Community Enterprise who invited me to organise the show. Sadly Barney the loveable black lab passed away recently and sympathy goes out to Lena and Patrick who loved him dearly. Barney was a typical lab full of mischief - and often deciding to 'go off on a wander' searching the streets of the local area for 'tasty titbits' like peoples lunch - 'A sandwich anyone?'!! Barney had learned to open the front gate and then he was off 'either towards the canal or down the Harrow Road past the shops and then 'often' could be found outside Westbourne Park Station lying in the sun or looking for a 'pat or two' from the rail staff or the passing commuters! 'Lee' our local dog warden at the time used to pick him up calling his 'owners' who had taken so many different 'escape proof'' actions that left them feeling both frustrated and amazed that 'their canine peter pan' managed to 'outwit them' every time. Was it the fact that he was given a 'tasty snack' and a bowl of fresh water at the station - or - was able to raid every available bin in sight or just the 'joy' of outwitting the very ones that he was so fond of!! I had first met Barney when Patrick his owner was walking him as a bouncy young pup who would bound up to meet and greet everyone he saw - whether it was a snappy terrier or an indulgent Rottie -and he loved the postman (we often wondered if the postman helped him in his 'escapes). Everyone knew Barney and Everyone loved him - and he will be missed by us all - well maybe not the ones who are still 'wondering' where their 'packed lunches' disappeared to - so with a fond farewell Adieu - Goodbye Barney - RIP and I am sure you will soon be creating havoc with all the other canine 'Angels'. Already into the summer month of June 2014 and already started my summer 'DogAdviceSurgery' in Queens Park Gardens - Dog Area on Mondays twice a month! Exciting - and Monday I met Lena a very friendly Staffordshire Bull Terrier - who loved people but due to a 'bad experience with another dog' she was a bit fearful when meeting new canine pals. Her recall was in need of attention but after a few training tips - and mmmmmmmmmm - a few tasty treats - she learned to 'rock and roll with recall'. My next one on one is two 'Bullies' - Father and son - need to get their social skills in order before they get given a local ASBO!! Meeting them again on Friday. Looking forward to the next one on the 22nd June @ 1pm - same time same place. Freckles the jack russell has already put his name down. Also I have got private funding from a small charity to have more Free Dog Training Classes for the community of Queens Park. Especially to work with Bull Breed owners if they need one on one sessions before coming to a 'Alldogbreeds WELCOME' class. Got a problem with your new rescue dog - new pup or your own rountine or work schedule has changed and is affecting your dog's behaviour - Seperation anxiety - barking indoors or outside at traffic or joggers or both! If a private one on one session is required I offer £5 off the fee for any customers of Grand Union Pets. What a week it has been my computer 'died' and I got a new one which I still am adjusting to!!! So apologies firstly to my 'doggy clients' for a delay in their 'back up emails'. \One of my clients last week was a malamute six month old female who had already had at least three homes -rescued from Gumtree by a caring couple they needed an assessment on his behaviour and help with training and working out the best way of socialising her and settling her into a rountine and setting boundaries. Look forward to seeing her progress next week for the next training session. The following day was a little pomeranian in W2 near Hyde Park - a great little chap just wasn't into joggers - policeman on horseback - and dogs Smaller than him - he would just like to run with the big guys even when they didn't really want to run with him! Friday my 'boarder' Domino from Thailand went home to his mama - hoping for that last doggy snack before leaving. The weekend was full of muddy walks - wet dogs and even more muddier floors!!! Monday was my birthday and before you ask 'age is just a number' - started off with a leisurely walk then a phone call regarding a small dog who had been seriously attacked by another dog who apparently had attacked another dog within 24 hours. Sadly the dog who attacked was known never to be walked and the only time he got out was when he managed to escape out the front door - a victim himself of an irresponsible owner!! After getting the details from both owners of the dogs concerned and making a report I needed the white chilled wine and good food at the Thai restaurant and to celebrate my birthday with my friends and talk about what we love best - dogs!! I hope everyone enjoyed the Bank Holiday despite the weather. 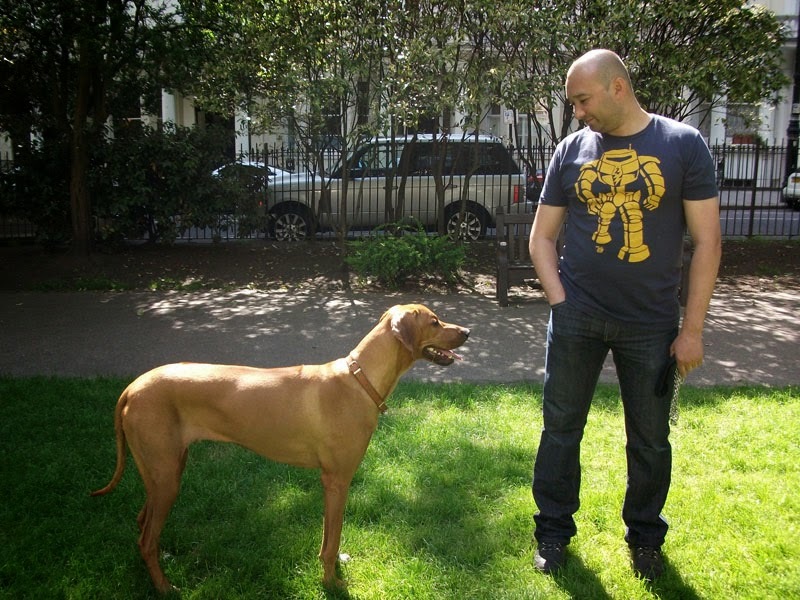 If you feel your dog needs a one on one you can call me on #07949523710 or email canineculture@googlemail.com or visit my website www.canineculture.co.uk - and of course you are still welcome to come along and see me to discuss your dogs behaviour. After a great Easter week end and spending time with my three dogs - all rescues - two from UK - and my latest family member being Kiki Diamond from Greece settling in well 'paws under the table' already!! I had to get back to work - to pay for their 'future' - pet insurance - food and of course vet bills!!! And I do LOVE my work but 'working with dogs' and even though 'clients' give you as much details regarding 'history' - behaviour patterns - you still don't really know what the dog's real problems are until you meet the dog - the owner and all the family members!! Sometime you can get inquires from an 'anxious' or 'worried' owner -} 'Rescue dog' - Four years old - shows signs of aggression - lunging at people - 'or' a ten week old pup that is 'biting' - 'or' I have just castrated my dog and there is no change in his behaviour' - why hasn't he calmed down straight away - he is still aggressive even though he was castrated -} Castration does not solve a behavioural problem but can help when your dog meets another un neutered dog - a ten week old pup is not 'biting' but 'mouthing' - BUT you want to address the problem early before the pups 'mouthing' becomes biting as the pup becomes older - or - a Rescue dog that not much history is known but you find the lunging is - not aggressive but can be intimidating to others - but can easily be addressed by 'lead control' and then 'more training' off lead. Tuesday I went to meet my client and his beautiful Belgium Shepherd - An adult - First thing he did on greeting me was to JUMP UP - the owner holding onto the lead with all the muscle he could - I stood still - folded my arms 'Blocking him' - he tried jumping up again - I turned my back again with a Block then turned back(No Verbal) and then he sat (immediately I was ready to greet him) - we were ready for the next step - walking on lead. In just a short time and using 'lead control' and the 'Block' and Rewarding Positive actions with Verbal Praise his owner could see a difference - and promised to carry on with the same technique and follow the routine I had set him. Looking forward to the next session in a couple of weeks. Wednesday from a Belgium Shepherd to a chihuahua - a 'former' lapdog whose elderly owner had passed away and relatives had bought the dog to a rescue home - his new owner wanted her to socialise and learn how to walk on a lead - we feel that though the chihuahua was four years old - she had probablly never actually walked anywhere outside and the garden was her 'toilet area' in her last home. It was basically starting the training as you would do with a small puppy - which we did - her owner seemed impressed with the progress booked me for at least another couple of sessions!! I indeed am lucky to be working with dogs but I also know that Insurance is SO important and even if you are walking YOUR dog or someone elses dog YOU should have third party insurance at least and when I see some dog walkers with their eight or ten dogs I DO wonder if they have insurance or even pay tax. IF you ARE walking someone elses dogs and are a dog walker YOU SHOULD have insurance that covers PUBLIC CARE AND LIABILITY . Working with all breeds of dogs and dog owners from all over London - meeting dog lovers - from all over the world - in UK I am often asked the 'question' - Why do you support 'transporters ' small rescues' and 'donate' to help the dog the street dogs of Romania! And the answer is 'simple' - The Romanian Government was given over one billion euros by the EU Commission for 'public funds' in 2013 - the final payment by August 2013 and then the 'animal carnage began' - stray dogs on the streets of Romania were 'rounded up' by 'dog catchers' - beaten - poisoned and worse - loyal rescuers like Arwen - Adina and many more romanian angels - work night and day to rescue 'as many as they can'. They need help with donations so they can fully vaccinate neuter and transport to loving owners - in other parts of Europe and UK with the proper paperwork and passports. In UK we have some kind of animal welfare system - in romania they have NONE and their own Government is paying to kill these dogs in the most horrific way. What a month it has been - Dog training classes - One to One Referrals - Meeting the wonderful Mercy from Iran - Boarding Domino from Thailand and watching my beautiful girls welcome another young lady to the family - Kiki from Greece - Welcome! Which brings me to my 'blog' and my subject 'Rescue' - I now have three rescues - my previous dogs Rocks and MJ were both rescue - one saved as a puppy with his siblings from being drowned - the other living in a cupboard with three other dogs for the first six months of his life. Both of them were my introduction to RSPCA and the Mayhew Animal Home and to learning the trials, the tribulations and the JOY of owning a rescue and making me study dog Psychology and most importantly work and learn from 'dogs' themselves. I am sure all those who have 'rescued' 'fostered' or worked around animals have known those 'trials and triumphs'!! I work with all breeds of dogs - and each dog is different - with their own personality - their very own soul - and each day I learn more about them - I only wish I could understand SOME of the human race - as well! Rescue - why do we rescue - and I am sure we all wish we could take every dog - mostly staffordshire bull terriers - out of the 'seven day or die' pounds - The streets of Turkey - Romania - Greece - Just go over there and STOP the horrific killings of 'galgos' - of street dogs who are poisoned - beaten and worst when spaying and neutering and governments spending money on animal welfare and humane shelters would NOT only stop the over breeding - the endless strays - it would stop the horror and inhumanity that is going on this very day. Rescuers - we have amazing dedicated volunteers like Gemma Ashford - Niz Khan - K9Angels that spend their time - and money - fundraise just to get a few of these dogs to safety and a chance of life. Then we get the volunteers in Romania like Arwen Juliana - Adina Artene and others that dedicate their life and soul to the street dogs - neutering and spaying against all the odds. Then there are our friends from the other side of the atlantic who share the thousands of cats and dogs - young and old who each day are put on USA's death row - pledging their donations hoping that just one rescue would come forward - one guy I love to the max (though I have never met him ) - Gary K - Sharon M - a lady that is humbling in her pursuit of rescue for so many - and Ruth from CA - amazing people - a canine and felines 'lifeline'. Lastly but not least our beautiful poundies - in UK - so many I can not name just one - of the small rescuers - the fosterers - the transporters - without listing them all but they know who they are - and the work they do - sharing - united in their aim - Get that poundie OUT - SAFE and shedding tears for the many that do not LEAVE through the front door. Animals are gentle loving creatures whom we domesticate - often abused and cruelly used for greed - for gain - or worse - and yet so many - rescued - or picked up as strays or 'cruelty cases' just look for that love - that hand of comfort - and yet because of our failures end up in pounds - shelters - or taken because of laws that are meant to protect but destroy and the 'victims' become the 'ones on trial' and the abusers walk 'free' - my last word - CHANGE THE LAWS and stop the abuse - CLOSE DOWN puppy farms - and stop the over breeding and abuse - NEUTER AND SPAY your pet and be responsible for their lives and STOP the thousands of unwanted litters being killed. What a great day - well okay a bit wet and a bit windy but a great session with the dogs that braved the aftermath of the storms and though this is the second to last session - two new dogs and their owners joined us - Prada a bullmastiff mix and Holly a cockerpoo!! Bailey the staffie was there much improved - well done to his owner Chris (who I am also mentoring in 'working with dogs') - - Oscar well - Oscar was still very verbal especially to the new 'guys' but his owner is sure he is improving!! Good to see Sheba the German Shepherd this week - was 'pulling on the lead' still but her recall and social skills had vastly improved. The weather was too much for Molly the Romanian and B the staffies owner was not feeling too well (hope you feel better soon). NB It is always important to 'check' if (especially a pack of dogs are in an enclosure or even just another dog) that they have no 'behavioural issues' if the dog and owner are unknown to you. Back to my class - I really enjoyed today and felt pleased with the positive response especially from the newcomers and being a smaller class today I could give more individual training to each member. Gave out 'doggy homework' to Prada and Holly - yep and their owners as well - next week being the final class until the spring. I will be at the Grand Union Pet Boutique @174ShirlandRoadLondonW93JE on Friday 14th February between 1pm-2.30pm to give Free advice on dog behaviour, toilet training, diet, dog laws and any dog anti social problems. After a Free consultation if you feel your dog will need a one on one then we can make an appointment for a training session in your own home and local park at a set fee. You are welcome to bring your dog - have a cup of coffee or tea and a friendly chat about your faviourite pooch! Met up with Ghost the White German Shepherd and his owner for a one to one referral - Poor Ghost is only six months old and yet has had two homes already - thankfully his third owner will never give up on him. Ghost has never been socialised with people or other dogs but he has not a bad bone in his body. One of his problems is he pulls on the lead and another is he jumps up suddenly whenever he sees another dog - he wants to 'meet and greet' but with no social graces to another dog and a member of the public it can be quite intimidating. When he actually sat and I held out my hand to him - he licked it. A Beautiful dog and I am sure that with 3 more sessions Ghost will be a pure pleasure to walk and to interact with other dogs. Next session 18th February. St Georges Square SW1 -Dog Area - another day of dogs, owners and offering advice and training tips to the residents of South Westminster. The weather was not too bad - the rain did start but not for long and I am sure I saw the 'sun' trying to find a way through the clouds. First on the scene was one year old Lucy a little staffie cross - her owners had only had her a short while and wanted to stop her 'pulling on the lead' - 'help' with her recall' - her reaction to other dogs was very good and she was always the first to back away even when a large white Samoyed stole her ball and 'growled'. Lovely little girl - I worked with her owners on her recall and we walked round practising 'lead control' regarding the pulling on the lead. Stella the cockapoo - well thank goodness she is black - she was tearing around 100mph in the muddiest puddle she could find - But she had to leave early - her owner had got the times wrong - her walking on the lead and recall has improved greatly in just a week. Then there was Boatswain A very handsome 'do what I like' German Wiemar pointer - I spoke to his owner who wanted some advice to 'prepare for the forthcoming baby' (the human kind!!) and her husband will come to the next session next week to get some help with recall and to get Boatswain more sociable with other dogs. And How can I forget 'Tubbs' the leader of the pack of Minature Wirehaired Dashunds - who liked to 'be very verbal' on entrance to the park or when some other dog dared to come into 'his kingdom'. A few words about using non verbal and the 'block' for negative behaviour and verbal reward for POSITIVE actions - he is a very clever dog and could become a 'star pupil'. Frazier the Beagle was listening intently (I am sure) about the 'barking at other dogs' lesson and showed his appreciation by not barking - but his little jack russell companion definitely wasn't having it - But he was quiet - well for a moment or two. I am so blessed to work with dogs and people that want the best for their dogs and also when some local resident came over to me and said ' I can not believe the difference in that dog in one session- Great work' (dogs are very quick to learn - it is US as owners that sometimes find it takes longer to learn!!). Its always nice to be appreciated but I too have to thank Westminster Council who decided to take action on education and responsible dog ownership and care in the community and help me set these classes up. I just wish other councils would take the same action. What a turn out today - considering the wind and the rain - In fact everyone was on time - all the dogs raring to go. The Dog Enclosure @PaddingtonRecreationGround was wet and muddy but good enough for the class to begin. Bailey the staffordshire bull terrier was bouncy as ever and he was quick to 'sniff out' that I had dog treats in my pocket - following me around like 'a lovesick pooch' - typical male!! There was Ime the Beagle with her Polish Mum and Dutch Dad - recall is not really a Beagles priority in life - Food is Ime's first love - and Hugo the pomeranian who definitely was Top dog with his female owners. 'Mouthy' Rudi the English Bull Terrier pup at four months old thought 'mouthing' at peoples ankles was great fun - Sorry Rudi 'Thats why you are here at 'Dog Skool'!! Old Faithfuls Molly the Romanian GSD x and B the Staffie welcomed the new 'doggy members' with a few 'friendly but warning barks' - Oscar the terrier cross was back to his Bark ' Look at me' self. Then Lovely 'Ghost' the white German Shepherd - at six months with two homes already behind him was bouncy jumping up - just wanting to meet and greet - but did not know how to react around other dogs and people. Not an aggressive bone in his body but I could see his owner was getting stressed and as there is a 'Free one to one referral' place funded by the Ward Budget I have arranged to meet them both next week. 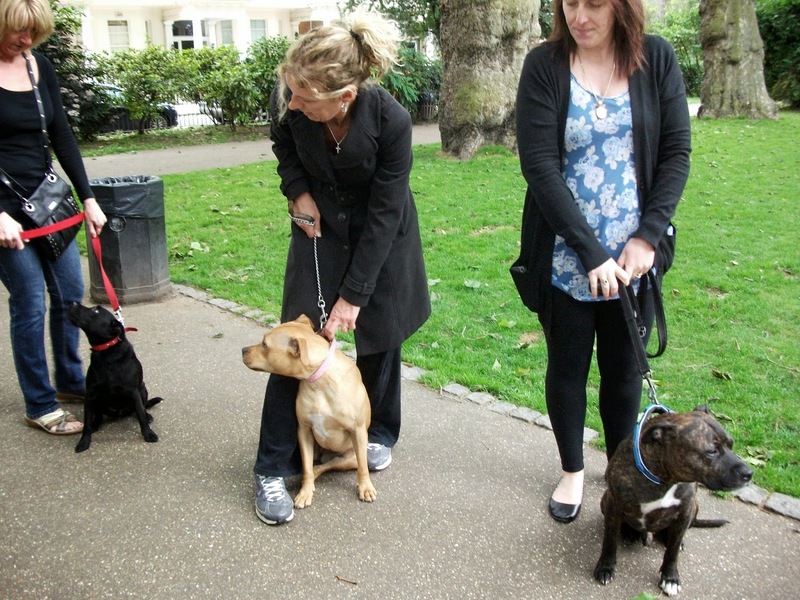 five dogs did 'text' - weather permitting they would return next week and 'Ella's owners are meeting for a one to one. Bassie's owner is away and will be back on the last session. I was still pleased with the turn out and met a lovely lady called Becky who helps run a rescue who thought the classes were a great idea! Grand Union Pets Boutique asked if I would like to use the downstairs basement of their Boutique to hold a 'Dog Advice Surgery' and I decided to do a couple of 'pilots' before Christmas 2013. The 'Dog Advice Surgery' would be where you could come and see me with your dog (s) - have an informal chat bout your pup - adolescent teenage pooch or your Senior (who might still need a few social graces - or maybe just a few tips regarding 'Senior moments'). A nice cup of coffee or tea - an informal chat and a few hopefully helpful tips - and all free - if a one on one is needed then you can book an appointment with me to come to your home for a private training session at a set fee. The pilots went well but unfortunately due to illness and other commitments - the dates for the Surgery to commence officially were delayed but tomorrow @ 2.30pm-3.30pm I will be at Grand Union Pet Boutique 174 Shirland Road Maida Vale W9 3JE www.grandunionpets.co.uk - and ever other week after. Well I am back in circulation after the ups and downs of Christmas and the New Year, falling foul of a 'popular virus' that put me out of action for two weeks - and my poor dogs to 'block walks' and 'garden confinement' for any outdoor scenery!! Chelsea my little 'rescue' chihuahua/jrt corgi was by my side taking on the role of 'DogNurse". Missy my other rescue gave me the occasional 'are you okay mum and is there enough dog food supplies' and Kiki my new girl slept glad to be safe and secure inside a loving home. I started the new year with the 'blessing' of a little dog that was put out on the streets of Greece after her owner passed away and if had not been for 'North Wind' who took her off the streets until she could be safely be brought over to UK by Niz Khan a dedicated animal advocate who spends her time helping street dogs around the world and in UK. My new 'sister' to my two girls Missy Blue and Chelsea Rose has settled in well and with her gentle ways has already enriched my life. 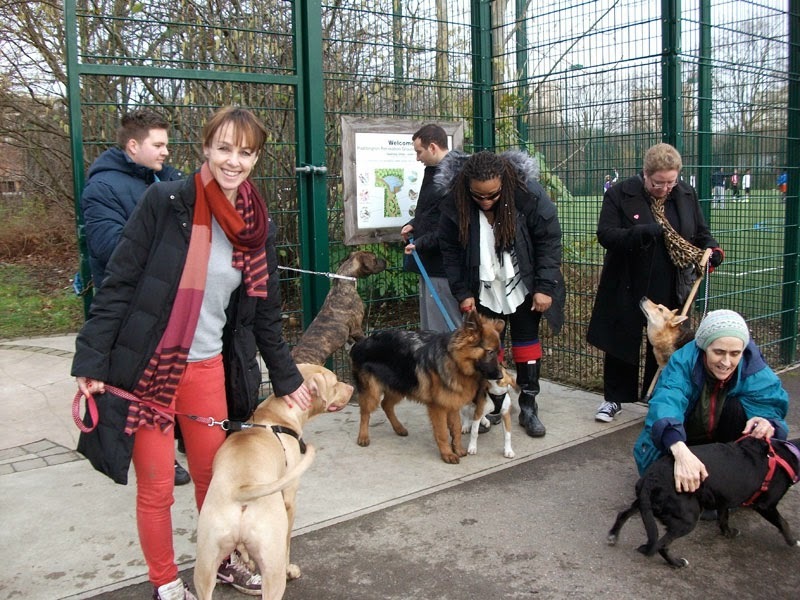 Dog Training Classes commenced 18th January in the wards of Harrow Road - the weather was for a change!!!! - rather wet but at Least it was not too much for Max the Jack Russell, B the lab/cross staffie, Bailey the staffie and Molly from Romania - who braved the torrential!! Five Polite Pooches 'texted' their 'absent' apologies. Last Saturday (25th January) - what a difference the sun makes and even though the rain fell again from the skies - it waited till the class had finished before its downpour!! There was the 'teenager' GSD Sheba from W9 who came bounding in the dog enclosure - straight into the muddiest part - till she spotted Oscar the jrt x who was all barks and growls - you can guess who backed down - Sheba of course!! Then Handsome Bassie a Ridgeback/mastiff cross such a gentle boy with a thing about jumping up. We had Bobby the beagle pup who constantly pulled on the lead and needed to learn 'recall' - Bailey the staffie was back and loved his new pals - Molly and B made an entrance - gradually getting to know Sheba and Bassie. It was also good to see Ghost the white GSD who his owner rescued from an unsuitable home six months after her beloved Cedar passed away. Poor Ghost has a lot of issues - he is a lovely dog but he has had no social interaction with dogs and the interaction from humans before was not good memories. We first of all walked in twos around the enclosure practising walking on lead and with another dog - then we walked outside in the open green area past dogs off lead - kids in the park - using the 'block' and the lead control for pulling and jumping up. Then back to the dog enclosure for off lead and to show how to 'recall' your dog - which will we will be concentrating in the next session.